The A&P Sommer Foundation is dedicated to raising children’s awareness of pets and domesticated animals. To this end, the Foundation proposes free learning materials and provides funding for exhibits and special events for the general public. The A&P Sommer Foundation was the principal sponsor of Dogs and Cats (Chiens et Chats), a child- and family-oriented exhibit at the Cité des Sciences museum in Paris. Created for the event, this animated film looks at the common history of people and animals. This film is the exclusive property of Universcience. It may not be used or shown elsewhere without specific, formal authorization. Fun posters about animals and kids. Click to download. “Dans la peau d’un chien” (“In a dog’s shoes”) at Paris’ Parc de la Villette. 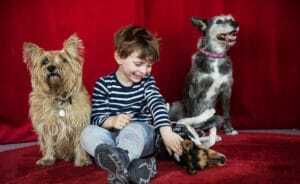 Children ages 6 to 10 (and their parents) can learn to better understand and communicate with dogs.